The Saints and Aints are on fire today after a group of black pastors met with Donald Trump for yet another "faith leaders meeting", aka photo op. Trump sat down with a group of inner-city pastors from all over the country during a White House roundtable last night that reportedly focused on prison reform efforts. Trump fed them his lies, per usual, telling them that his administration has been working hard to help prisoners re-enter society and find work after serving a prison sentence. The conversation took an interesting turn when black Ohio pastor Darrell Scott, who was an early Trump supporter, dubbed 45 as the "most pro-black president of our time." Come again? Then, he goes on to attack President Barack Obama, because you know folks can't get their point across about 45 without bashing the actual most pro-black President in the meantime. "This president actually wants to prove something to our community, our faith-based community and our ethnic community. The last president didn't feel like he had to," he added, saying of Obama: "He got a pass." And what pass was that? Maybe we missed something because Obama was dragged relentlessly EVERY SINGLE DAY of his presidency simply for trying to make the nation a better place. Which is far better than what we can say about Trump and his racist, classist and gas-lighting rhetoric. Whether you agreed with Obama's policies or not, you can't take away the fact that he wanted a more unified nation. We can't say the same for Trump. Also, we hear Pastor Scott is allegedly on Trump's payroll, so there's that. As expected, black folks are dragging these pastors on social media, just like they did when Kanye West, Steve Harvey and more black celebs took a seat at the photo-op table with Trump. 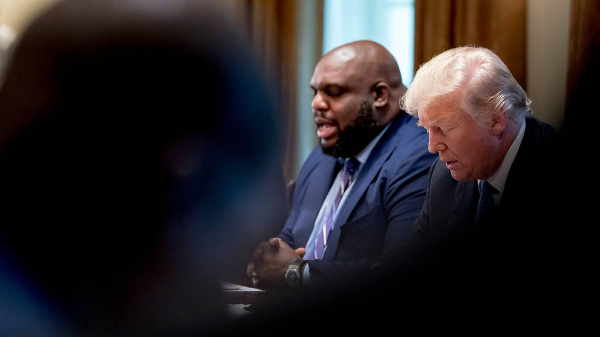 South Carolina megachurch pastor and tv star John Gray has been catching backlash for praying with Trump during the meeting. Now, he's responding to the drama letting folks know that God instructed him to attend the meeting, and that he did so for the greater good. While he wasn't the one who made the comment about Trump, he damn sure didn't speak up or challenge him in that moment. Silence speaks volumes too. Thoughts on these pastors meeting with Trump, again?